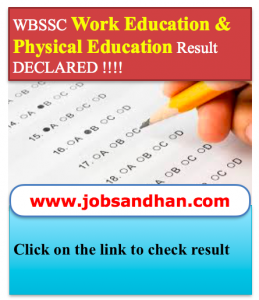 Update 3.01.2019: WBSSC Work Education & Physical Education Final Result (1st SLST 2016) Released now. Check the Subject Wise merit list from the link below and download the public notice regarding publishing of the result. Check here to Download WB Primary TET Previous Question Paper PDF. WB School Service Commission WBSSC Result for 1st SLST Work Education & Physical Education Written Test has been published now. Merit List Download Link has been given below. Candidates can check their merit list / result and marksheet online from the link of the exam merit list we have given here in the post. Expected Date for publishing of the West Bengal SSC Merit List 2017 for Work Education & Physical Education for Assistant Teacher (AT) posts in Upper Primary (UP) classes. 1st State Level Selection Test (SLST) 2017 was held on 4-06-2017 from 12PM to 1PM. Candidates had to appear in Written Test for the posts of Assistant Teacher (AT) in Govt Aided Schools. You can check the answer key from the link. Those who have appeared in the written exam are now awaiting for the marksheet / scorecard. Expected / probable date for publishing the exam result can be discussed in the comments section. Still West Bengal School Service Commission has not declared the expected date of announcing of result. We will update in the page about the probable result publishing date once any official notification comes from the official portal. Recruitment notification for Work Education & Physical Education Assistant Teacher was published on the official website which is www.westbengalssc.com. Result of the work education and physical education Assistant Teacher in Upper Primary Class Level through 1st State Level Selection Test 2016 held on 04.06.2017 has been finally declared by WBSSC today. Find the link given below to check the merit list. Read the notice below from the official website of West Bengal School Service Commission regarding the declaration of merit list. Enter your 14 digit roll number to check the score. Shortlisted candidates for work education subject will be available after the publishing of the merit list. Candidates are requested to visit the official website as well as our website to know when the WBSSC Work Education Result 2017 2018 will be published. WBPSC Miscellaneous Exam Question Papers & Model Set FREE DOWNLOAD – Click here. Result of the written test may also be checked online. For this you must enter your details like registration number, roll number, username / password details. Marksheet / scorecard is required to be checked from the official website. The exam was held offline at various centers in West Bengal. Merit List may also be downloaded in PDF format. If you have forgotten the application number or the roll number, you need to contact the official website or the WBSSC. West Bengal School Service Commission has not published the Work Education & Physical Education (SLST) scorecard 2017 yet. We have given the link of the website where it may be published. Once the merit list becomes available, we will update the link in this page. Download link of the exam result– Click here. (Result for the 1st SLST has been published finally on 1-02-2018. Not Published yet. After it is declared, we will provide here the direct link where candidates will be able to check their score card from the official website of www.westbengalssc.com). Also check our MCQ Questions Answers section to get free study materials important for various competitive examination. work education ar interview &personality test ar date koto diner ar madhye publish hote pare plze janale kritanga Thakikb. please let me know the date of interview for work education slst. please let me know date of interview of work education. Is there any second list of qualified physical teacher ? Ami w.ed s.t.40 ta write anser karechhi kintu 1ta ansare whiterner babahar karechhi er jnya ami not qualified for P T .please janaben? ki karane eta holo , er jnya ki wbscc nikat kichhu kara jabe? Sadaran graduate Dhari bped passed Ra ki physical education teacher hoya have ki ? Is there any chance for second list of physical teacher ? SLST Work education (AT),2017 Result out ki ai january tei hobe? Aj ki ssc work and phisical education r result? Work education result ki beriechhe ??? Upper physical education result ke? any update? expected cut off? Work er result ki berobe ? Can you inform the probable date of announcement of result? jobsandhan.com is not official website. So, kindly check the details from official website before applying and checking the right information. We will not be responsible for any loss of you.